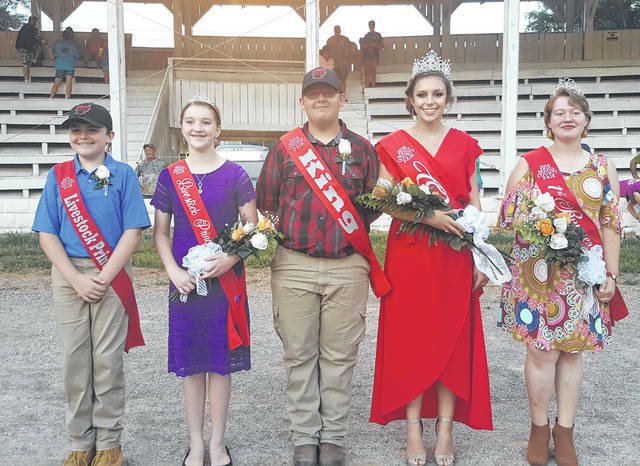 Mattison Finalw was crowned the 2018 Meigs County Fair Queen and Austin Rose the 2018 Meigs County Fair King during the opening ceremonies of the 155th Meigs County Fair on Sunday evening. Joining Finlaw and Rose in the fair court are Queen First Runner-Up Raeven Reedy, Livestock Princess Raeann Schagel and Livestock Prince Matthew Jackson. Pictured, from left, are Jackson, Schagel, Rose, Finlaw and Reedy. Complete coverage of the opening ceremonies, including the crowning of the fair royalty will appear in the Tuesday edition of The Daily Sentinel and online at mydailysentinel.com. https://www.mydailysentinel.com/wp-content/uploads/sites/14/2018/08/web1_8.14-Fair-Royals-1_ne201881222257653.jpgMattison Finalw was crowned the 2018 Meigs County Fair Queen and Austin Rose the 2018 Meigs County Fair King during the opening ceremonies of the 155th Meigs County Fair on Sunday evening. Joining Finlaw and Rose in the fair court are Queen First Runner-Up Raeven Reedy, Livestock Princess Raeann Schagel and Livestock Prince Matthew Jackson. Pictured, from left, are Jackson, Schagel, Rose, Finlaw and Reedy. Complete coverage of the opening ceremonies, including the crowning of the fair royalty will appear in the Tuesday edition of The Daily Sentinel and online at mydailysentinel.com.